Hand Numbered Number 100/100 Plan B X T&C Skate Co-lab. Signed by Plan B Riders! Plan B Skateboard Deck Felipe Victory 7.6"
MODEL Sheffey Ollie. 7-Ply Pro Canadian Maple Skateboard Deck from Plan B. Maybe you’ve got a wicked case of razor tail. Maybe you snapped your board kickflipping that 10-stair. Maybe your emotions got the best of you and you focused your deck. Included is Cole Heat 8.375", Sheffey Ollie 8", Pudwill X EBS 8", Trevor MVP 8.25", Team Blood Shot 8.25". Plan B Collin McKay Skateboatd Deck 1991 Lady Luck Official Skate Bomber WWII OG. Condition is New. Shipped with USPS Priority Mail. Please, let me know if you have any specific inquiries, or would like to request any additional photos. I do accept overseas buyers, but please let me know before you bid. I’d like to work out shipping, before the transaction is final. Sorry, but the FREE SHIPPING IS ONLY FOR US DESTINATIONS. Also, I ship once a week, so allow 7-10 days from payment. Thanks for the interest & Good Luck! Included is Heat 8.375", Light Year 8.3", Signature 2 8.375", Team OG Intent 8.125", Team Blood Shot 8.25". Hand Numbered Number 100/100 Plan B X T&C Skate Co-lab. Signed by Plan B Riders!. Condition is New. Shipped with USPS Priority Mail. MODEL Felipe X EBS. 7-Ply Pro Canadian Maple Skateboard Deck from Plan B. Maybe you’ve got a wicked case of razor tail. Maybe you snapped your board kickflipping that 10-stair. Maybe your emotions got the best of you and you focused your deck. Condition is Used. Has hardly been used. MODEL Duffy This Machine Kills. 7-Ply Pro Canadian Maple Skateboard Deck from Plan B. Maybe you’ve got a wicked case of razor tail. Maybe you snapped your board kickflipping that 10-stair. Maybe your emotions got the best of you and you focused your deck. MODEL Sheckler X EBS. 7-Ply Pro Canadian Maple Skateboard Deck from Plan B. With a sheet of Black Diamond griptape. Maybe you’ve got a wicked case of razor tail. Maybe you snapped your board kickflipping that 10-stair. Super Rare Original Danny Way Plan B Danny the Menace deck here. Highly collectible and sought after. Good luck!! Included is the Torey Pudwill 8.0", Ryan Sheckler 8.25", and the Felipe Gustavo 8.125". PLAN B CHRIS JOSLIN "COCO SNACKS" SKATEBOARD DECK. SCOOBY DOO INSPIRED GRAPHIC. THE DECK HAS BEEN GRIPPED BUT NOT SETUP. THERE ARE A FEW SMALL IMPERFECTIONS. 7-Ply Pro Canadian Maple Skateboard Deck from Plan B. With a sheet of Black Diamond griptape. Maybe you’ve got a wicked case of razor tail. Maybe you snapped your board kickflipping that 10-stair. Maybe your emotions got the best of you and you focused your deck. 7-Ply Pro Canadian Maple Skateboard Deck from Plan B. MODEL Team OG Teal. Maybe you’ve got a wicked case of razor tail. Maybe you snapped your board kickflipping that 10-stair. Maybe your emotions got the best of you and you focused your deck. 7-Ply Pro Canadian Maple Skateboard Deck from Plan B. Maybe you’ve got a wicked case of razor tail. Maybe you snapped your board kickflipping that 10-stair. Maybe your emotions got the best of you and you focused your deck. MODEL Cole Lowlands. 7-Ply Pro Canadian Maple Skateboard Deck from Plan B. Maybe you’ve got a wicked case of razor tail. Maybe you snapped your board kickflipping that 10-stair. Maybe your emotions got the best of you and you focused your deck. MODEL Team Rasta. 7-Ply Pro Canadian Maple Skateboard Deck from Plan B. Maybe you’ve got a wicked case of razor tail. Maybe you snapped your board kickflipping that 10-stair. Maybe your emotions got the best of you and you focused your deck. Own a piece of skateboard history. Included is Open Seas 7.7", Wavy 8.125", Sign 7.75", X EBS 8", Team OG Intent 8.125". 7-Ply Pro Canadian Maple Skateboard Deck from Plan B. With a sheet of Black Diamond griptape. MODEL Team OG Teal. Maybe you’ve got a wicked case of razor tail. Maybe you snapped your board kickflipping that 10-stair. MODEL Pudwill X EBS. 7-Ply Pro Canadian Maple Skateboard Deck from Plan B. Maybe you’ve got a wicked case of razor tail. Maybe you snapped your board kickflipping that 10-stair. Maybe your emotions got the best of you and you focused your deck. 2 Stevie Ray Vaughan Pat Duffy Plan B Skateboards . Condition is New. Shipped with USPS Priority Mail. MODEL Pudwill X EBS. 7-Ply Pro Canadian Maple Skateboard Deck from Plan B. With a sheet of Black Diamond griptape. Maybe you’ve got a wicked case of razor tail. Maybe you snapped your board kickflipping that 10-stair. MODEL Sheckler X EBS. 7-Ply Pro Canadian Maple Skateboard Deck from Plan B. Maybe you’ve got a wicked case of razor tail. Maybe you snapped your board kickflipping that 10-stair. Maybe your emotions got the best of you and you focused your deck. MODEL Pudwill Wavy. 7-Ply Pro Canadian Maple Skateboard Deck from Plan B. Maybe you’ve got a wicked case of razor tail. Maybe you snapped your board kickflipping that 10-stair. Maybe your emotions got the best of you and you focused your deck. Any any deck you want can be put on this shelf. THE DECKS ARE NOT INCLUDED. MODEL Sheffey MVP. 7-Ply Pro Canadian Maple Skateboard Deck from Plan B. Maybe you’ve got a wicked case of razor tail. Maybe you snapped your board kickflipping that 10-stair. Maybe your emotions got the best of you and you focused your deck. 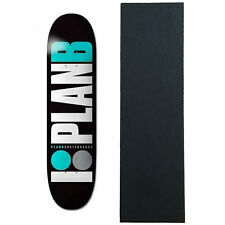 New ListingPlan B Pat Duffy Marblo Man Reissue Skateboard Deck - Only 150 Made!! RARE NOS PLAN PAT DUFFY MARLBORO MAN REISSUE SKATEBOARD DECK - ONLY 150 MADE SOLD OUT!! WITH FREE PLAN B STICKER! You need this deck for your Plan B, Duffy, or reissue collection! Included is Cole Heat 8.375", Cole Signature 2 8.375", Felipe Sign 8.3", Joslin Mixtape 8.375", Team OG Intent 8.125", Sheffey MVP 8.0", Team Blood Shot 8.25". You get the item in the picture.. Mega RARE limited edition deck with the paperwork from Pepsi.. It is signed as well. Plan B Felipe Biggie EBS autographed deck from the Berrics. Mint In plastic wrap, berrics doesn’t ship in shrink cause it’s autographed. This deck sold out in under 24 hrs! Extremely rare. Plan b and EBS collab!